The year I spent Christmas in Florida, it was the only state on the US weather map that wasn’t snow white. I pottered about in shorts and a T-shirt in glorious sunshine, exploring the extraordinary archipelago and the highway, US1, that leads to the southernmost point of the United States, accompanied by what was then Conch FM, a wonderfully smooth jazz radio-station that, with a characteristically American sense of excess, produced thirty solid hours of Christmas jazz over Christmas Eve and Christmas Day. US1 hops across the islands following the route of Henry Morrison Flagler’s Florida Overseas Railroad, which was closed down by the Labor Day Hurricane of 1935 and afterwards converted into the Overseas Highway. Most of Flagler’s poured-concrete closed-spandrel bridges were easily widened for two-lane motor traffic simply by building lateral cantilever extensions, but the Bahia Honda Bridge created extra difficulties. 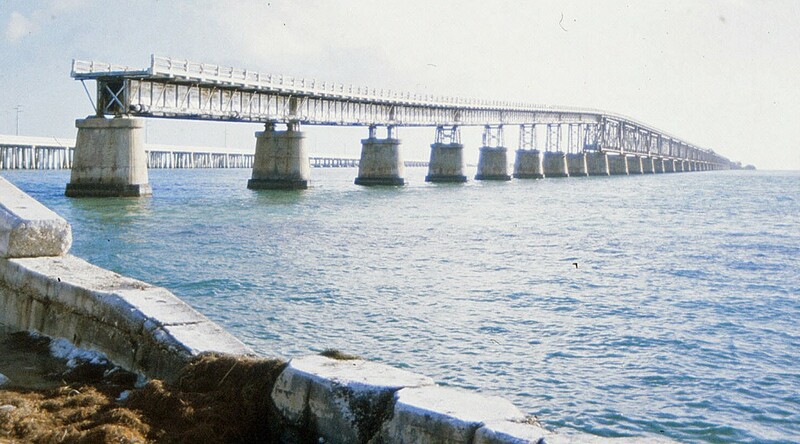 “Bahia Honda” means “deep bay”, and because of the depth of the channel, 24 feet at its deepest, the bridge, 5,055 feet – almost a mile – long, has steel trusses, through which trains ran on a single track. There was no way of widening the trackbed for road vehicles to pass, and a mile-long bridge couldn’t possibly operate as a one-way system controlled by traffic lights. The solution was to lay a roadbed on top of the truss with ramps at either end, providing a precipitous mile-long driving experience 65 feet above the sea. The Bahia Honda Bridge remained part of the only way in and out of Key West until it was replaced by a concrete viaduct on a different alignment in 1972. It remains, unmaintained and gradually deteriorating, a haunting reminder of a time when the only way to Key West was on a train, gingerly picking its way at a maximum speed of 15mph across the ocean. This entry was posted in Transports of Delight on December 30, 2015 by Mike Higginbottom. Across the road from the Pomegranate Theatre, Chesterfield Borough Council maintains another auditorium, the Winding Wheel, based on the former Picture House, to provide an even wider range of events – everything from classical music to beer festivals, Russell Watson to Ken Dodd – alongside the film and drama of the long-established civic theatre. 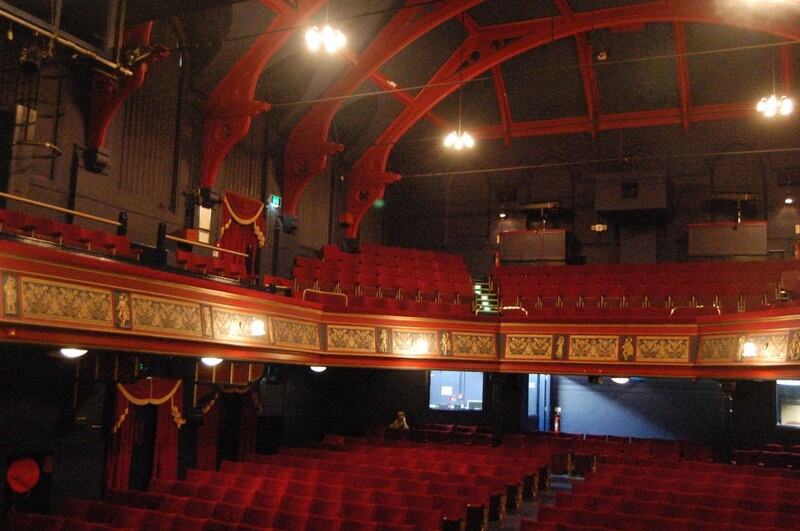 The Chesterfield Picture House, designed by the Sheffield architect Harold J Shepherd, opened on September 10th 1923. Its façade, which incorporates shops on each side of the entrance, is in the mock-Tudor style that the Borough Surveyor, Major Vincent Smith, encouraged in the town centre. The auditorium is in a faintly grotesque Renaissance manner, with a rather more refined T-shaped restaurant looking out over the street. The foyer and the restaurant still retain elegant fireplaces, that must have provided a welcome as well as welcome heat in a town that gained its livelihood from coal. There was originally an organ, for which Reginald Dixon, then in his late teens, was employed as deputy organist at £5 a week, a significant advance on his first £3-a-week engagement at the Stocksbridge Picture Palace north of his native Sheffield. The Picture House did well enough for the owners to invite Harold Shepherd back in 1930 to build a ballroom on an adjacent plot, and in 1936 they sold out to Oscar Deutsch, who rebranded it as an Odeon the following year. 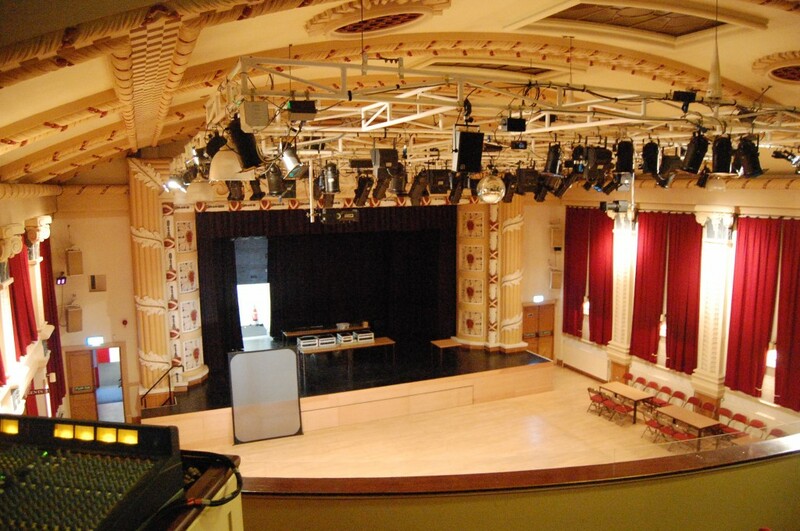 Films lasted until 1981, and a nightclub, Jingles, carried on in the ballroom and café areas until 1987 when the Borough Council bought it and converted it to a multipurpose entertainment venue. In the cinema auditorium the renovations involved stripping out the stalls seating, installing a flat floor which hides the bottom part of the proscenium, and installing a flexible lighting and sound rig suspended from the barrel ceiling. The Winding Wheel Exhibition, Entertainment and Conference Centre opened in 1987 and was listed Grade II in 2000. Its capacities are now 600 seated theatre-style in the stalls, with 300 in the fixed balcony seating, or 1,000 standing in the stalls area. For a town with a population of around 90,000, Chesterfield is fortunate in the quality of its auditoria and the range of entertainment that the Winding Wheel and the Pomegranate Theatre between them provide. What’s on at the Winding Wheel is online at http://www.windingwheel.co.uk/whats-on/winding-wheel.aspx. This entry was posted in Fun Palaces on December 21, 2015 by Mike Higginbottom. The Borough of Chesterfield has a proud record of supporting civic theatre. The Stephenson Memorial Hall, an adult-education institute with a large meeting hall, was built in 1879 to commemorate the railway engineer George Stephenson (1781-1848) who spent the last years of his life in the town and is buried there. Chesterfield Corporation bought the hall in 1889 and subsequently enlarged it to create a theatre stage and proscenium, but it was leased to a cinema company until 1946. When the lease expired the borough council established a civic repertory theatre company, which opened in February 1949 with a production of Philip King’s See How They Run (1945). Weekly repertory theatre, in which a cast on contract rehearse next week’s play in the daytimes while performing each evening and some matinées, became fortnightly in 1965, and continued until as late as March 1981. The final show, Joseph and the Amazing Technicolor Dreamcoat broke the house record, playing for three weeks at 98% capacity. This hard-working little theatre, serving a local population of around 90,000, claimed illustrious alumni. Nigel Davenport and David McCallum were in the cast of Hobson’s Choice, the 200th production (1954), and Diana Rigg made her stage debut while assistant stage manager in The Passing of the Third Floor Back (1958). The council set up a new production company, Chesterfield Theatre Ltd, which operated the theatre as a touring house from February 1982, and adopted the name Pomegranate Theatre in June of that year. The pomegranate tree “leaved and eradicated proper flowered and fructed Or” appears on the ancient seal of the borough and in the modern borough coat of arms. The Pomegranate is an intimate, welcoming venue with a rich diet of drama, music, film and other events. It is supported by the Chesterfield Theatre Friends, a group which promotes events, raises funds and looks after the theatre’s archive: http://www.chesterfieldtheatrefriends.co.uk/about-us.aspx. There is also a separate Pomegranate Theatre Friends Membership Scheme [http://www.chesterfieldtheatres.co.uk/our-theatres/membership.aspx which offers discounts, advance booking opportunities and free parking to regular patrons. 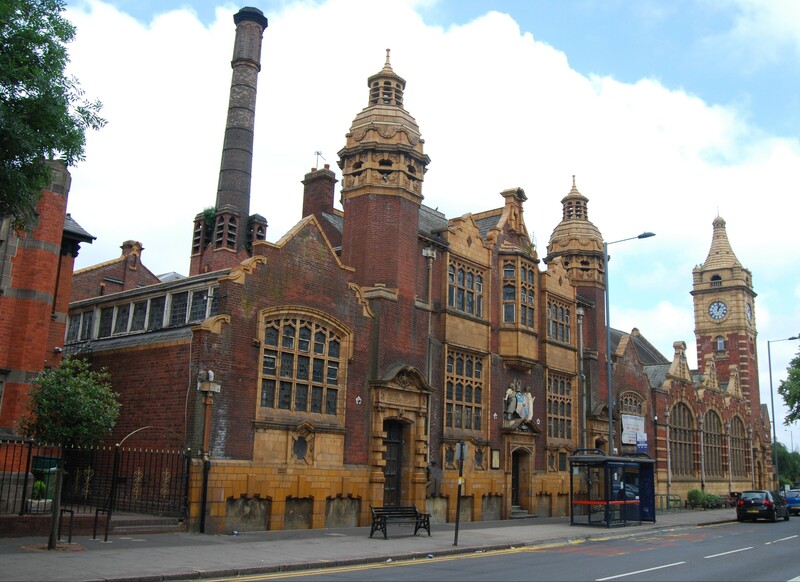 This entry was posted in Fun Palaces, Victorian Architecture on December 16, 2015 by Mike Higginbottom. 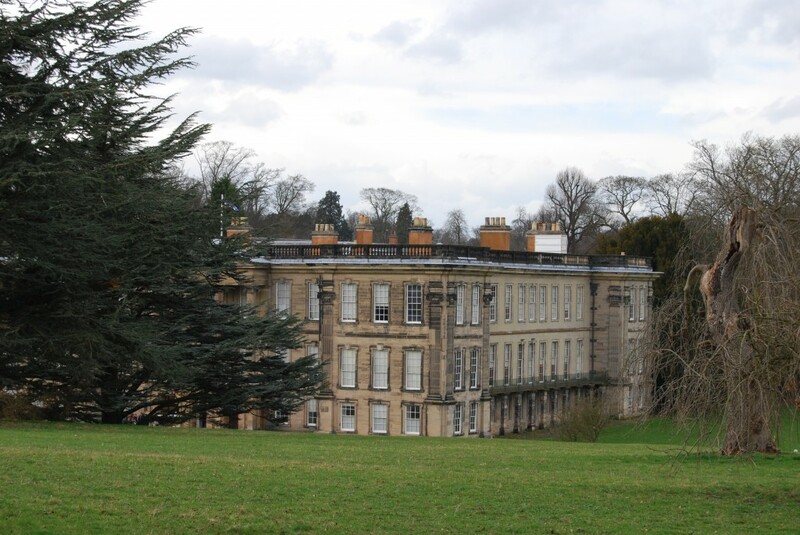 The present house was built in 1701-4 by Sir John Harpur, the fourth baronet, whose father had had the great fortune to inherit the estates of his great-grandfather’s various descendants, and the misfortune to die when his son was little more than a year old. No known architect has been identified for Sir John’s externally impressive but internally inconvenient house. His neighbour Elizabeth Coke remarked of some misdeed that “like Caulk House, the thing is done but nobody did it”. Sir Henry Harpur, the eccentric seventh baronet, married a lady’s maid and became so reclusive that he was known as the “isolated baronet”, yet changed his name to Harpur Crewe in the vain hope of reviving a long dormant Crewe barony. His son, Sir Vauncey Harpur Crewe, 10th and last baronet, was descended from the isolated baronet through both his parents, and in him the trait towards reclusiveness became extreme. From inheriting the estate at the age of forty in 1886 until his death in 1924 his only major contribution to local life was to take his turn as High Sheriff of Derbyshire in 1900. Like the burrowing Duke of Portland he had more time for his tenants and workers than for his peers, and communicated with his children by letter: eventually he turned his only unmarried daughter out of the house for smoking. No motor-car passed the gates of Calke Park in his lifetime, and though he repeatedly sacked servants for keeping fires too hot for his collection of stuffed wildlife they were easily re-engaged because he did not know one from the other. At his death the property passed to his sister, Mrs Hilda Mosley, and from her to her nephew, Charles Jenney, another shy bachelor who changed his name to Harpur Crewe in 1961. He left his younger brother Henry (who also changed his name to Harpur Crewe) with a tax burden of £8,000,000 when he inherited in 1981. Henry Harpur Crewe’s determination to save Calke as a unique historic site attracted the support of the National Trust, the National Heritage Memorial Fund, the Historic Buildings Council and SAVE Britain’s Heritage. Eventually the Chancellor of the Exchequer, Nigel Lawson, promised £4,500,000 towards endowing the house and park in his 1984 Budget Speech to keep the place intact. The house was substantially as it had been left in 1924; Sir Vauncey had done little but add cases of stuffed animals since his father died in 1886. Here was the accumulated bric-a-brac of generations of country-house inhabitants and their servants, yet little of significant artistic value except for the most astonishing survival of all, the State Bed, still in its original packing because no suitable family room had height enough for it. Many thousands of items had to be catalogued, photographed and removed for safe-keeping while the structural restoration of the building was carried out. Alongside heavy engineering to stabilise the building, enormous care was taken to retain the largely undisturbed patina of the nineteenth century. In the Drawing Room the chairs had been covered for almost their entire lives, so their textiles were revealed in superb condition, but the curtains, continually exposed to daylight, simply disintegrated and had to be woven anew to the original pattern. The original linen-backed wallpaper, dating from around 1855, had to be stripped and then put back on the wall. When the little pot pug dog with the broken foreleg was returned to his place in the entrance hall, the matchbox that had been found propping him up went back into place also. Calke is a memorable place to visit [http://www.nationaltrust.org.uk/calke-abbey], now restored in “as found” condition like the much smaller Mr Straw’s House in Worksop. This entry was posted in Country Houses on December 10, 2015 by Mike Higginbottom.